Are you in compliance with the new ADA requirements? Harris Communications makes it easy to be in compliance with the new ADA requirements for deaf and hard of hearing hotel guests. Effective March 15, 2012, the Federal Americans with Disabilities Act (ADA) changed the accessibility requirements for guest rooms in hotels and motels for individuals with hearing loss. The ADA requires that all hotels and motels provide guest rooms accessible to individual with physical disabilities. The new changes have increased the minimum number of hearing impaired accessible guest rooms required. Harris Communications makes it easy to be in compliance with the new ADA requirements for deaf and hard of hearing hotel guests. Conveniently stored in hard carrying cases, their prepackaged kits include the necessary products to comply with the ADA. The most popular kit is the ADA Compliant Guest Room Kit 1000 with the ADA Compliant Guest Room Kit 500 being a more economical version. 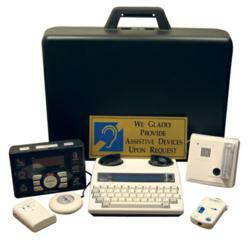 The ADA Compliant Guest Room Kit 1000 includes a TTY (text telephone); an alerting system with functions for phone, door knock, alarm clock, and sound monitor; a telephone handset amplifier; a smoke detector and an ADA compliance sign, all packaged in a hard carrying case. Products are selected based on the needs of deaf and hard of hearing guests, giving them the capability to communicate via phone/TTY, and be alerted to the phone, door knock, alarm clock and smoke detector. Customized kit solutions are also available. A sales representative can advise you on the best solution for your needs. ADA kits range in price from $409.00 - $679.00. An additional $25 shipping charge will be added to each ADA kit ordered. Contact the Sales Department at 800-582-8569 for customized ADA kits or special quotes. Harris Communications has been in business since 1982 distributing assistive devices for deaf and hard of hearing people. Their comprehensive product line includes devices from respected manufacturers in the industry. A print catalog of assistive devices is available with most products available on their website at http://www.harriscomm.com.